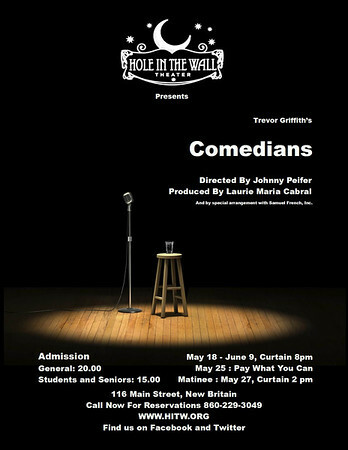 NEW BRITAIN - Hole in the Wall Theater’s next show, Trevor Griffiths’ “Comedians,” runs Friday through June 9. Shows will be at 8 p.m. on Fridays and Saturdays, May 18, 19, 25 and 26 and June 1, 2, 8 and 9, and 2 p.m. on Sunday, May 27. Pay What You Can Night will be Friday, May 25. Hole in the Wall Theater is at 116 Main St., New Britain. To reserve a seat, call 860-229-3049 and leave a message. Tickets can be bought online at hitw.tix.com. After 8, parking is free at the Szczesny Garage on Chestnut Street, next to the police station. The show is directed by Johnny Peifer and produced by Laurie Maria Cabral, assistant produced by Thom, and stage managed by Keyshmarie Diaz. The play will feature the following actors: Carmine Lavieri as Eddie Waters, Charles Willson as Burt Challenor, Steven Siemiatkoski as Gethin Price, Alan Burkholder as George McBrain, Victor Tellez as Sammy Samuels, Jordan Wassil as Mick Connor, Tim Adams as Ged Murray and Luis Marrero as Phil Murray. Prerit Gupta and Melanie Cox will alternate playing Mr/Ms. Patel. Taylor Hays will play the Caretaker, Kate Micari-Miller the Concert Secretary and Billy Moro the Pianist. Posted in New Britain Herald, , New Britain on Wednesday, 16 May 2018 21:45. Updated: Wednesday, 16 May 2018 21:48.